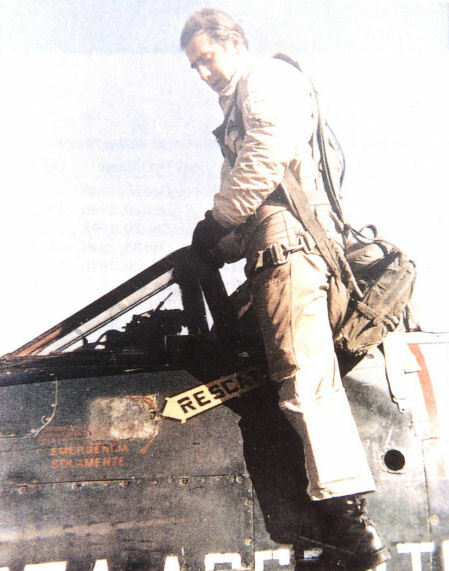 Mounted on a TR-50 rack - designed and built in Argentina - 5in T-10 rockets came into use in early 1960. 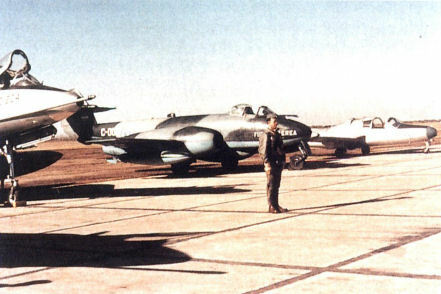 Note the Peruvan Air Force C-46 in the background. After landing at the forge Newbery city airport, a Meteor is towed to the 'Julio 9' exhibition in September 1947. Tucking the gear up quickly following a rough field take-off. 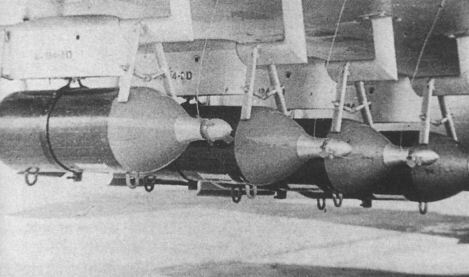 Argentine-made 275lb (125kg) bombs under the wing of a Meteor F.4. Note the wires for arming them. 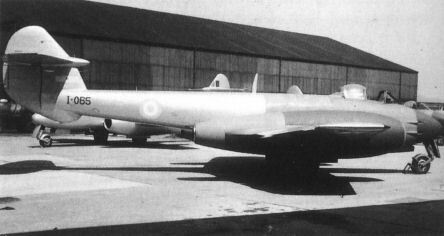 C-035 in May 1960, shortly before it was destroyed in a mid-air collision that July. 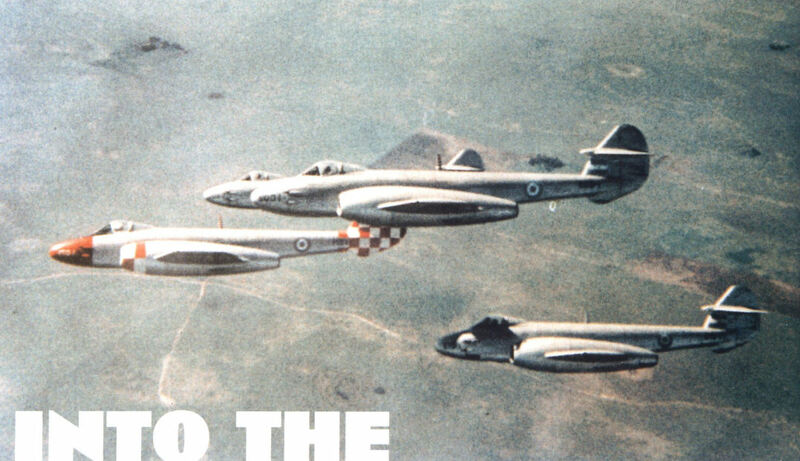 Believed pictured during flight test in the UK, I-065 was destroyed in a forced-landing in 1958. Striping on the ventral tank and a rear fuselage strip are notheworthy on this view of C-01. 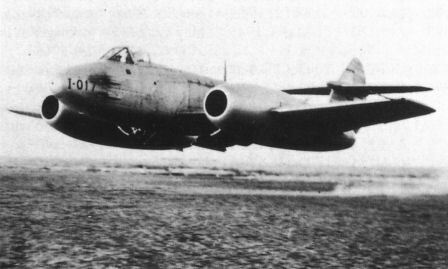 In flight view of the last Argentine Mk.4s - I-100. 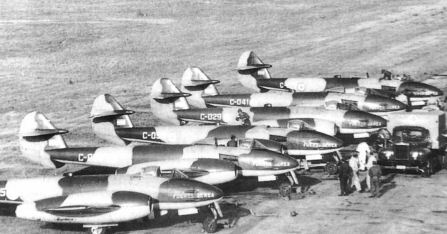 Camouflaged Meteors preparing for an exercise in 1966. I-099, the second to last of the batch. 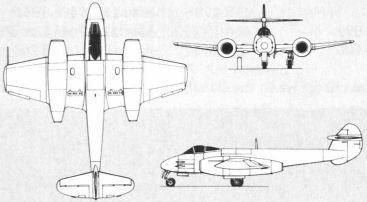 Unlike the vast majority of Argentine Meteors, it had an unblemished flying record. C-094 with green chequers on the fin and rudder. At work on the nose gear. 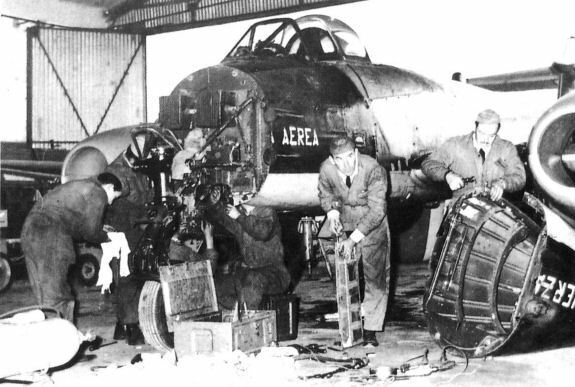 Note the large lead balance weights on the bulkhead.